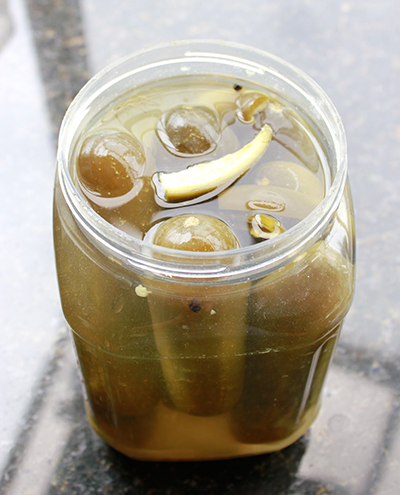 authentic, macrobiotic dill pickles* (Peter). 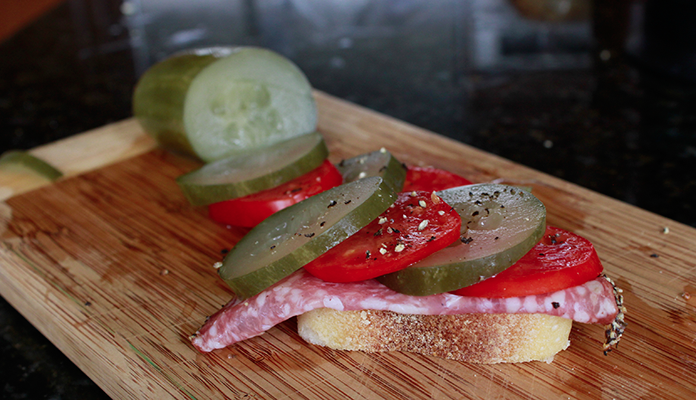 Home grown cucumbers are always best. But in season, they are often fresh and firm in the stores. 1. Wash jars - and especially lids - in dishwasher to sterilize. Or, wash in hot soapy water then rinse and air dry. I use plastic almond jars - but large glass jars are much better. 2. Rinse cucumbers very lightly (there are natural yeasts you want on the skins ). Cut flower ends off and retain 1/4" of stem. 4. Pack cucumbers into jars and add 2 or 3 cloves of garlic, 2 or 3 vertical strips of Jalapeño, 6" sprigs of dill (including dill flowers if you have them) and peppercorns. 5. Pour in brine and seal and tighten lids. Place in cool, dark place. 6. Wait two to four weeks. You may see some bubbles - that's the natural fermentation process taking place! The cucumbers' color will change to a light yellow-olive green. 7. Test if ready. There should be no "rawness" left. Once open, refrigerate. 8. 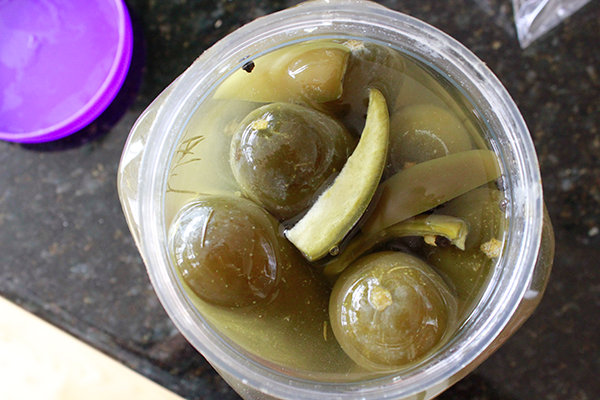 You may get some mold around the top of the pickles. I just spoon it off. If the pickles smell really bad, or are very soft, do not eat (I get the odd bad jar - just discard). * I have pickled hundreds of pounds of cucumbers over many years by this process. But I do not guarantee the process and users of this recipe must make all proper inquiries and assume all health & safety risks. Dad drying his dill in 1978. We only ever use fresh dill in our pickled cucumbers. When first opened, the brine is usually clear. It gets a bit cloudy once in the fridge. Cucumbers grow on climbing vines. I plant a hybrid strain. Dad didn't use jalapeños - but they add a nice kick. Not too many though.